Now enrolling for our new location in Lake City! ReWA believes that all children should have the opportunity to succeed in school and beyond. Often, refugee and immigrant parents feel disconnected from existing child care programs due to language, cultural, and religious barriers. Our Early Learning Center helps refugee and immigrant parents feel supported by providing childcare that breaks down language, cultural, and religious barriers. In ReWA’s classrooms, each child is encouraged to share their own culture and value other cultures different from their own. Our “Soy Bilingue” curriculum creates a balanced support of home language and culture, while equipping children with necessary English skills for their transition to Kindergarten. The “Highscope Curriculum” meets the social, emotional, physical, language, cognitive and literacy objectives for childhood learning and development using a play-based model. FOR MORE INFORMATION for Preschool in Lake City, ages 3- 5 years old, contact lakecityenroll@rewa.org or 206.721.0243. For our Preschool Program on Beacon Hill, ages 3 – 5, please contact beaconenroll@rewa.org or 206.723.3304. 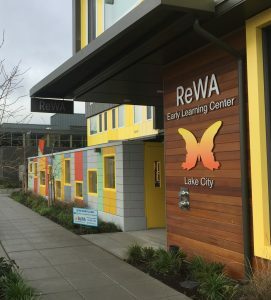 At the Main Office, for Childcare, ages 0 – 3, and Preschool Spring enrollment, ages 3 – 5, please contact mlkenroll@rewa.org or 206.721.0243.